A couple of years ago, my husband began contributing monthly to the Harlem Children’s Zone, a comprehensive community revitalization agency whose mission he deeply believes in. Around the same time, I began to think about what my cause might be. To the same extent that my husband is a slow-and-steady-wins-the-race kind of a guy, I operate in big bursts of energy here and there. And so it makes sense that daydreams about my chosen cause include visions of myself making humongous financial donations and/or becoming a global spokesperson for said cause. What about our Girls’ Days, where we get our nails done, bring home sushi, and watch Frozen over and over again? I thought. Why doesn’t that constitute the best day ever? Then it hit me: This is why my mom wants us to go to church and why she always buys my daughter books about non-violent conflict resolution. We’re supposed to be teaching the kid values. I sat up in the (imaginary) bathtub, put the bonbons down, and turned off One Life to Live. It was time, I decided, to go out and find myself a cause. Emily Moberly offers a book to a young reader at her Story Tent in the City Heights farmer’s market. I’d met Emily Moberly, founder of Traveling Stories, in 2011 during a visit to the City Heights Farmers’ Market. She sat on a small square of carpet reading to children in her Story Tent. Back then, although I didn’t quite get what she was up to, I loved her tagline: “investing in imaginations one library at a time.” So, as I set out on my quest to become a better person, I figure, why not start with books? I love books. Kids, too, I guess, but definitely books. On a bright Saturday morning in late March of this year, I head to City Heights and make my way into the market. In the past three years, the Story Tent, sandwiched between the bike-repair tent and that of a hat vendor, has expanded to three squares of carpet and two overhead canopies. But it’s not only the size that makes it easy to spot; it’s the children. The tent is crawling with them. The booth space is only about 12-by-12 feet, but I count 19 kids sitting up, lying down, reading to themselves, reading aloud to an adult, stepping over and around each other to get to the crates of books up front or the toys and prizes at the back of the tent. Those 19 children plus seven adults, a teenage girl offering face-painting, three collapsible sling chairs around the perimeters, and approximately 250 books, equal the liveliest booth in the market — by far. A young reader shows off a “Book Buck” reward for reading a book. Book Bucks can be traded for prizes. Moberly greets me with a huge smile, a hug, and a handful of green play-money bearing a sketch of a stack of books where George Washington’s face would be. “One Book Buck,” each reads. Then she wishes me well and turns back to a little boy awaiting her attention. “Wait, what do I do?” I ask, grabbing her arm in a please-don’t-leave-me panic, not quite ready to be set loose. She shows me the prize boxes, which contain items such as Starburst, nail polish, water bottles, Rainbow Loom rubber bands, and basketballs, each going for anywhere from 1 to 35 Book Bucks. Some kids spend it all on candy the day they earn it. Others save it up from week to week, keeping their eyes on the more expensive prizes. Sufficiently inspired, I let go of Emily’s arm and step gingerly into the tent. Pushing aside a pile of abandoned books, I fit myself into the few inches of now-available rug space and wait with a smile, wondering how long it’ll take to get noticed. I fan out my Book Bucks enticingly. It’s less than 30 seconds before a small Sudanese boy stands in front of me. He wears hiking boots three or four sizes too big and holds three books under one arm: Christmas Eve on Sesame Street; Wemberly Worried, by Kevin Henkes; and There’s a Wocket in My Pocket, by Dr. Seuss. “Can I read now?” he demands. His name is Arbab, and he is six years old. “How much is this worth?” he asks as he sits down. “Oh, okay. Well, then, ask Emily,” I say. “Right. I mean, Emily said one Book Buck per book unless it’s a chapter book,” I say, not sure at this point whether I should stand strong or be cool and give him, say, five per book. “Well, go ask her,” he demands. He pulls a wad of Book Bucks out of his pocket and counts them, making sure he still has the 16 he came to me with. When I ask why he needs 19, he points to the prize boxes and says he wants to buy stuff. He reads the books quite fluidly, needing no help from me, and I congratulate myself on making the right choice. If he’d struggled through the books, I’d have felt bad. “I got 19,” Arbab says. “I got 20,” Tahir says. He grabs two books from the pile I’d pushed aside, and, clearly in a hurry, begins to read Curious George Plays Baseball, by Margret and H.A. Rey, aloud. Later, an eight-year-old boy named Jimmy reads If You Give a Pig a Party, by Laura Numeroff, and melts my heart with a story about spending all 13 of his Book Bucks last week on his little sister who really wanted a prize out of the box. Miss Emily, he says, rewarded him with five Book Bucks that he plans to spend on himself this time. Elsewhere in the market a band plays, and someone’s nearby iPhone plays Miley Cyrus, “Party in the USA.” People walk by the story tent with their bags of produce and kettle corn, smiling in on the scene. For a moment, I feel really good about myself. But then the competition between Arbab and Tahir gets so fierce that about a half hour after my arrival, when I’m reading with a little girl named Emily, Arbab stands over me repeating, “Can I read? Can I read? Can I read? Can I read?” so many times that I begin to ache desperately for a beer, a mandatory no-talking rule, and a cigarette, though I haven’t smoked in many years. When the story tent shuts down at around 12:30, after all the books and prizes have been put away, and after the kids have dispersed, Moberly and I walk to a nearby coffee shop. At our outdoor table, she sits with one leg draped over the arm of her iron chair and chats about the birth of Traveling Stories. The story begins with her lifetime love of books. “I’m not embarrassed to say that in third and fourth grade, Nancy Drew was my best friend,” she says, her laughter pealing over the sound of ’Til Tuesday on the outdoor speakers. After her 2008 graduation from John Brown University in Arkansas (with a degree in journalism and a dream of becoming a foreign correspondent), she gave herself an “adventure year” teaching English in Honduras. She lived in La Ceiba, a Caribbean port city with a population of approximately 200,000, where she discovered it was impossible to find books to supplement the two or three she’d brought with her. At first, she only considered how this lack of available books affected her, but then one day, while her students wrote essays in the quiet classroom, it became clear to her that it was affecting them as well. “They weren’t all classics. There were some Goosebumps and I Know What You Did Last Summer,” she says, but she watched a handful of her students develop a hunger for the books. And when her year was up and she returned home, some of them continued to message her, inquire about or request books, or thank her for turning them on. Her friends encouraged her, said they wanted to be a part of it, and so in late 2009, she decided to hold them to it. Within a week, she had the full $1200. “I was, like, Okay, I’m stuck!” she says, throwing her arms in the air. Their first project was to start a library at an orphanage in South Sudan in 2010. Moberly did not go, but sent 1500 pounds of books by boat. She emphasizes that for every project, they begin with a contact in the country where they’re sending the books, and they monitor progress through that contact. In 2011, she took a group of eight volunteers to El Salvador to establish another library. That same summer, a group of four volunteers from Texas went to Nicaragua to open a Traveling Stories library at an art center. The librarian at the Nicaragua library, a college student, took it upon herself to establish a mobile library, where she travels monthly to rural schools to share books. Since its inception in 2010, Traveling Stories has opened seven libraries, including four in the Philippines. Kids read for “Book Bucks” in the Story Tent at the City Heights Farmers’ Market. In 2011, she brought the story tent to the City Heights Farmers’ Market. It began with a basic idea. The Book Bucks, the prizes, the do-it-at-home book reports would all come later. By this point in the story, I’m enamored, inspired, in awe, and ready to sign the paperwork so that I can turn my love of books into a nonprofit or otherwise serve a need in the world. But then it occurs to me to ask how Moberly gets paid. Turns out, she doesn’t. Not by Traveling Stories, anyway. Moberly works as an accounts-receivable manager at Forte North America Monday through Friday from 9:30 a.m. to 1:30 p.m. Traveling Stories takes up the rest of her day, from 2:00 to 7:00 or 8:00 p.m. as well as Saturdays, from 8:00 a.m. to 1:00 p.m. She takes Sundays off. Her main income comes from the day job, which pays approximately $2000 a month, but she occasionally drives for Lyft to make a little extra cash. On Sundays, her mom takes her to lunch, and occasionally, her friend Robert takes her to dinner. “It’s his way of supporting the nonprofit,” she says. By January 2015, Moberly’s goal is to get herself on salary at $35,000 a year. That means, of course, growing the nonprofit. And to that end, she’s offering franchise options for those who want to start libraries internationally or start story tents. Interested parties can choose $9000, $15,000, or $24,000 library packages. And as Traveling Stories affiliates, they’re in charge of choosing the library location, securing a committed local, naming the library, and fundraising for the package amount they’ve chosen. And 10 percent of what they raise goes to the Traveling Stories San Diego office, which goes toward the 501c3, filing fees for taxes and everything that goes into making sure the nonprofit is in good standing. Traveling Stories also provides the 501c3, the legal structure, administrative support, coaching, and the collecting, storing, and shipping of books. The whole thing makes my head swim. I’m stuck on the idea of $2000 a month and only Sundays off and consider that maybe starting a nonprofit won’t be my way of giving back to the world. The U.S. Department of Labour’s Bureau of Labor Statistics reports that 62.6 million people volunteered through or for an organization at least once between September 2012 and September 2013. Those most likely to volunteer were in the 35- to 44-year-old range (30.6 percent), married (30.7 percent), and college graduates (39.8 percent). This means that I have some catching up to do with my peer group. On a side note: I was surprised to find that the 35- to 44-year-olds volunteered in higher percentages than people of retirement age. Turns out that although the older folks represent smaller numbers, they far out-numbered all other age groups in hours worked (a median of 86 annual hours, compared to a median of 45 for my age group). Those numbers, while impressive, are just numbers until I attend the I Love a Clean San Diego volunteer training at the San Diego Foundation building in Liberty Station. The conference room smells of pizza. Over 90 volunteers sit in rows of cushy stacking chairs, listening intently to an I Love a Clean San Diego staffer discussing procedures for the upcoming Creek to Bay Cleanup. At first, I think to myself that this organization must really be something to have 90-plus volunteers show up. Then I realize they are here training to be site captains on the day of the event. Last year, the same event had 5900 volunteers show up. 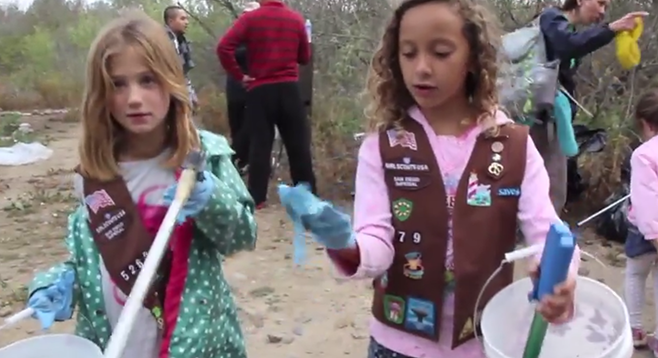 They collected 200,000 of garbage from canyons and beaches all over. San Diegans of all ages contribute to the Creek to Bay Cleanup event by cleaning up garbage in the San Diego River area. That, in itself, is something. But then when I think about the paid staff (12) to volunteer (30,000) ratio, my confidence in humanity in general, and San Diegans in particular, skyrockets. I Love a Clean San Diego has an annual revenue of approximately $1.1 million. (According to the 2012 annual report, 50 percent of their revenue came from government grants and contracts; 43 percent from corporations; 4 percent from individuals, and 3 percent from foundations.) Their volunteers work around 100,000 hours per year. Similarly, Mama’s Kitchen, at the corner of Home Avenue and SR-94, yields astonishing numbers. The $3.3 million organization delivers hot meals to San Diego County residents suffering from HIV/AIDS, and those battling cancer who are unable to prepare meals. Their volunteers include drivers, meal preppers, sandwich makers, and more. The organization’s 2012 annual report shows that one hour of volunteer time is valued at $24.75, that they received $836,711 worth of in-kind contribution via volunteer hours, and that their volunteers drove 132,194 miles, for an average of 847 per delivery day during 2012. At a rate of 55¢ a mile, which the volunteer drivers take on themselves, the mileage in-kind contribution for the year is valued at $72,707. These and other local multimillion-dollar organizations have beautiful, glossy brochures, big-time donors, and friends in high places who throw grand parties that bring in even more money. Honestly, I love the idea of attending charity balls and high-falutin’ $1000-a-plate dinners. I mean, if one absolutely must get dressed up for a party and spend a fortune on entertainment, one might as well do it for a cause. But there is also something to be said for offering one’s time. Pennington had 800 volunteers show up to help paint houses and fix fences during the 2011 FaceLift event she organized with Community HousingWorks. The weather helps, especially with the outdoor events. “I’d rather be out in the canyon or the creek pulling debris out than sitting in front of a computer any day,” she says. Once, many years ago, while traveling from Atlanta, Georgia, to Olympia, Washington, via Greyhound Bus, I decided that if I ever got rich, I’d drive my Jaguar to random Greyhound stops around the country and offer someone a ride to wherever they were headed. I’d provide weed, too, and pay for restaurant stops along the way. At the time, I’d never heard of the phrase “random acts of kindness,” but for my whole two-day trip, I alternated between the fantasy of someone saving me from the misery of the crowded bus and that of one day being able to do the same for someone else. It’s in the spirit of this idea that I google “random acts of kindness San Diego” looking for inspirational good-deed stories in “America’s Finest City.” I figure the search will yield a mysterious philanthropist or a series of kind acts that all lead back to said stranger. Instead, the first hit gives me a local meet-up group that calls itself, yes, Random Acts of Kindness San Diego. Kim Bolivar, founder of Random Acts of Kindness San Diego, sips beer and makes blankets for cancer patients at a fund raiser hosted by Societe Brewery. The group’s founder, Kim Bolivar, says her mother calls her “the perfect gentleman” because of the attentiveness she offers to those around her. Friends, too, have remarked on how self-consciousness never seems to get in the way of her helping out a fellow human being. And then there’s her potentially contentious divorce from a wealthy Mexican television producer that, in the end, went rather swimmingly. These days, she and her ex-husband are good friends, and he stays at her home when he visits town. And so it makes sense that when Bolivar read in an international flight magazine about a festival in Clonakilty, Ireland, dedicated to random acts of kindness, she decided she to share her proclivity for positivity with the masses. In July 2013, she started Random Acts of Kindness San Diego. Their list of past meet-ups includes giving apples and oranges to people walking by, planting flower seeds at St. Paul’s Villa, leaving inspirational and happy notes on parked cars, taping quarters to the vending machines at UCSD, and giving out free hugs. The hugs were not Bolivar’s idea, and she was uncomfortable with the thought of hugging strangers when another member suggested it. But she sucked it up and went along with the group to Pacific Beach and offered free hugs to strangers near Joe’s Crab Shack. All tasks I think I can do. Since July 2013, when Bolivar created the meet-up group, 170 people have joined. This alone speaks, I think, to the common human desire to do good. And although approximately 150 of those people have never shown up to an event, it still means something that they thought about it, doesn’t it? Bolivar, who is a member of seven other meet-up groups (for running, hiking, salsa dancing, yoga, and more), says she’s happy with the attendance because everyone who does show up is…quality people. Kind of like going to the gym. It turns out that the one day I’m free, the Random Acts people are joining the Advancing Compassion Project to help with the Food 4 Kids Backpack Program at the San Diego Food Bank. (Yes, that’s a lot of capital letters, and a lot of nonprofit organizations in one sentence. More on that in a minute.) I’m a tiny bit disappointed that my time with the Randoms won’t be quite as bizarre or random as free hugs, but I’m relieved, too, because the thought of hugging strangers (the majority of them men, as I noted from the photos posted on the group’s meet-up page) makes me queasy. I show up at the San Diego Food Bank in a pair of cork platform heels and am immediately told by one of the Food Bank employees that I won’t be allowed in the warehouse with open-toed shoes. He points me in the direction of box of old shoes that I can borrow from. A teenage girl dressed appropriately for assembly-line labor (sweatshirt, jeans, and sneakers) smirks at me. I hold my head high and slip on a pair of men’s size 13 leather loafers. When Bolivar arrives, wearing a bold pair of black-and-white tie-dyed leggings, she hugs about eight other people who have been standing around waiting for her. She pulls me over to the group and makes introductions. Today’s Randoms include a tall guy named Mark; a French woman named Delphine, whose meet-up profile reads, “I just love kindness”; a sporty lady called Susan; Bolivar and her gorgeous 17-year-old daughter, Tamara; a Mexican woman named Lucero who will be my best friend by the end of the day; and a couple of other people whose names I don’t catch. A brief peek into the world of volunteering in San Diego reveals not only a host of organizations seeking volunteers (women’s shelters, animal shelters, hospitals, the zoo, environmental groups, museums, and so on) but also a few organizations dedicated to helping mobilize volunteers on behalf of nonprofit organizations. One group, HandsOn San Diego, provides a calendar of volunteer projects and opportunities. Another, Advancing Compassion Project, serves as a project coordinator or fundraiser for select nonprofits. Today, they’ve rallied the 50 or so volunteers here (including college kids seeking community-service points, a Girl Scout troupe, and the Randoms) on behalf of the San Diego Food Bank’s Food 4 Kids Backpack Program. We will spend the morning filling bags full of food for kids whose only meals come from the free lunch and breakfast programs at their schools. The bags will get tucked into their backpacks before they go home for the weekend. At 9:30 or so, we crowd into a conference room. After a quick briefing by first Food Bank staffers and then the Advancing Compassion team, we’re shuffled into a huge, cold warehouse that smells of slightly molded oranges. Giant shelves stand against one wall stacked from floor to ceiling with stack-on-stack of boxes, bins, and crates of food. There are cardboard boxes everywhere, and it looks somewhat chaotic until I start to get the lay of the land. Two assembly-line areas have been set up in the middle of the room. Each consists of five or six long tables set up end to end. On either side of each table, a few feet out, stand stacks of cardboard boxes. On top of the tables, open cardboard boxes sit at regular intervals. We’re separated into groups of lifters and non-lifters. We non-lifters are told to line up on both sides of the tables so that we’re facing one other person with a box in between. At one end of the table, people will tie knots in the end of yellow mesh bags. After those in the middle have filled the bags with food, the people at the other end will tie knots in the top of the bags and place them in boxes. I stand directly across from a guy whose nametag reads Trevor. He wears his sunglasses on the back of his head. A box filled with snack-sized packets of sunflower seeds sits on the table between us. No one actually says, “On your marks. Get set. Go!” but that’s what it feels like, because all of a sudden, the net bags start coming at us half full of single servings of raisin bran and soup, granola bars, squeezable tubes of yogurt, packets of SunButter, fruit snacks, small boxes of milk, and so on. As soon as I toss in a pack of sunflower seeds and pass the bag to the graham-cracker lady at my right, Lucero passes another one my way. It doesn’t take long to get into a rhythm, and when we do, Lucero and I jump into a conversation that covers everything from manicures (we’re both obsessed with gel) to kids (she has none, yet wants at least 20) to San Diego restaurants (I swear by the new Veggie Grill at UTC, she promises to try it) to Bolivar (who smiles and waves at us from one end of the table). We laugh a lot. Everyone does. We’re all in it together. Around the room, here and there, the lifters open new boxes and help to replace the old boxes on the tables as they empty. A radio plays Tina Turner, Bon Jovi, the Cars, Barry White, just barely high enough to hear above the din of conversations, laughter, and the ripping open of cardboard boxes. During a sudden lull, I figure it’s probably close to quittin’ time and check my phone, anticipating one of those, “Oh, my gosh, can you believe how much time has passed?” Turns out, it’s been about 40 minutes and we still have an hour and a half left to go. At which point I begin to watch the clock. I think I can compare it to a trip to the gym: You know it’s a good idea, and you know you’ll congratulate yourself for sticking it out when you’re done, but the minute you start to watch the clock, it slows way way way down. So, yeah, the standing begins to make my back speak up, and I could use a cup of coffee, and I’m learning much more than I’d like to know about a loud man on the other side of the table who hasn’t stopped talking about himself for two hours, but, like at the gym, there’s also great payoff. At 11:45, we’re instructed to stop what we’re doing and gather around for the count. The grand total, they tell us, is 2418 bags of food that we’ve assembled today. Our side of the room assembled 1138, which makes us the losers to the other group’s 1280. I’m okay with that; it’s still the most fun I’ve ever had wearing someone else’s size-13 leather loafers. And besides leaving with a feel-good sense of my little impact on the world, I also leave with two more names (Bolivar and Lucero) on my list of people I’d like to drink with. I’ll get my chance soon enough. Bolivar has created a meet-up event around her upcoming birthday: a walking food-and-drink tour where the celebrators will leave lavish tips along the way. Prom dresses. That’ll be my next stop, I think. The Princess Project is looking for volunteers to help “make a teen sparkle inside and out.” The idea of dressing and accessorizing financially challenged high school girls speaks to me. So does Spellapalooza, the boozy spelling-bee fundraising event hosted by Traveling Stories. Or maybe something with hammers: Habitat for Humanity? I may not yet have found my one cause, but I’m armed with a handful of Best Day Ever ideas to share with my daughter.